In his final Met performance, the great Jon Vickers as Samson leads a superb cast in Saint-Saëns’s romantic retelling of this biblical story. 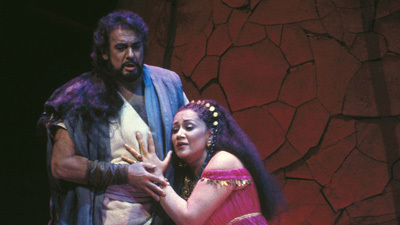 He stars opposite Marilyn Horne, who delivers a captivating portrayal of the temptress Dalila. Louis Quilico is the High Priest of Dagon, Terry Cook is the Philistine leader Abimélech, and John Macurdy sings the Old Hebrew. French maestro Jean Fournet conducts.